Released in 8-panel Digipak. Includes a 20-page booklet. "Berlin Schöneberg" was recorded at a Berlin radio concert (Sender Freies Berlin) on 15th of December 1976. "Vie de rêve" was recorded at a solo concert at "La Basilique St. Rémy", Reims, France on 21st of April 1976. The music was formerly released only in "Jubilee Edition" and "The Ultimate Edition". Published 1997 by P.O.EM. Musikverlag ("Vie de rêve"). Published 1999 by P.O.EM. Musikverlag ("Berlin Schöneberg"). © 2010 Klaus Schulze & kdm, under license to MiG GmbH. ℗ 1997 Klaus Schulze & Klaus D. Mueller ("Vie de rêve"). ℗ 2000 Klaus Schulze & Klaus D. Mueller ("Berlin Schöneberg"). "Nostalgic Echo" and "Titanische Tage" were recorded at Klaus' solo concert in Brussels, Belgium in November 1976. "For Barry Graves" was recorded at a German TV concert on 13th January of 1977 in the studios of the German TV station WDR, and broadcast was on the 28th February '77 in the TV show "Musik Extra 3". The music was formerly released only in "Silver Edition" and "The Ultimate Edition". Published 1993 by P.O.EM. Musikverlag ("Nostalgic Echo" and "Titanische Tage"). Published 1999 by P.O.E.M. Musikverlag ("For Barry Graves"). © 2010 Klaus Schulze & kdm, under license to MiG GmbH. ℗ 1993 Klaus Schulze & Klaus D. Mueller ("Nostalgic Echo" and "Titanische Tage"). ℗ 2000 Klaus Schulze & Klaus D. Mueller ("For Barry Graves"). "The Poet" was probably recorded at the concert in Oberhausen on the 7th November 1976. "The Oberhausen Tape" was probably recorded at the concert in Oberhausen on the 7th November 1976. The music was formerly released in "Historic Edition", "Jubilee Edition" and "The Ultimate Edition". Published 1995 by P.O.E.M. Musikverlag ("The Poet"). Published 1997 by P.O.E.M. Musikverlag ("The Oberhausen Tape"). © 2010 Klaus Schulze & kdm, under license to MiG GmbH. ℗ 1995 Klaus Schulze & Klaus D. Mueller ("The Poet"). ℗ 2000 Klaus Schulze & Klaus D. Mueller ("The Oberhausen Tape"). 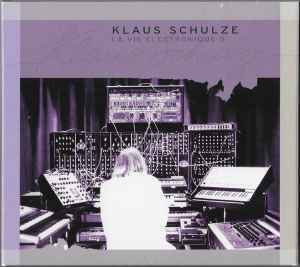 Nostalgic Echo/Titanische Tage( disc 2) the my BEST live by Klaus Schulze! This is like Timewind. So highly recommended.